Picture Perfect Productions Pte. Ltd.
TELL US MORE ABOUT PICTURE PERFECT PRODUCTIONS. Picture Perfect Productions is a digital content creation company producing engaging and effective online content that can be disseminated across traditional media and the online social networking sphere. We bring with us 20 years production and program making experience and work with our clients to develop effective and engaging content to tell “the” story. Our storytelling avenues include branded programs, infomercial content, marketing, case studies and the more traditional corporate video content. We can give you a camera crew too! Singapore is the ideal hub for Asia. There is a wealth of creative talent here and doing business is clear and transparent. With regards to the digital content world, there are numerous opportunities as well as a wide and varied client base in the Asia Pacific region for us to work with. We want to grow a sustainable business and build a reputation in Singapore as a company that can deliver quality programs and not only be adaptable to all our client requirements but allow them to expand their brand reach through Digital Content. We also want to develop a creative hub that nurtures talent. 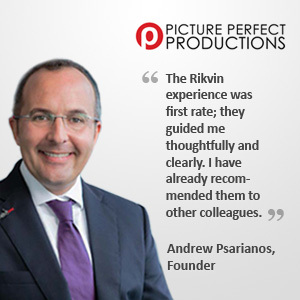 The Rikvin experience was first rate; they guided me thoughtfully and clearly. I have already recommended them to other colleagues.